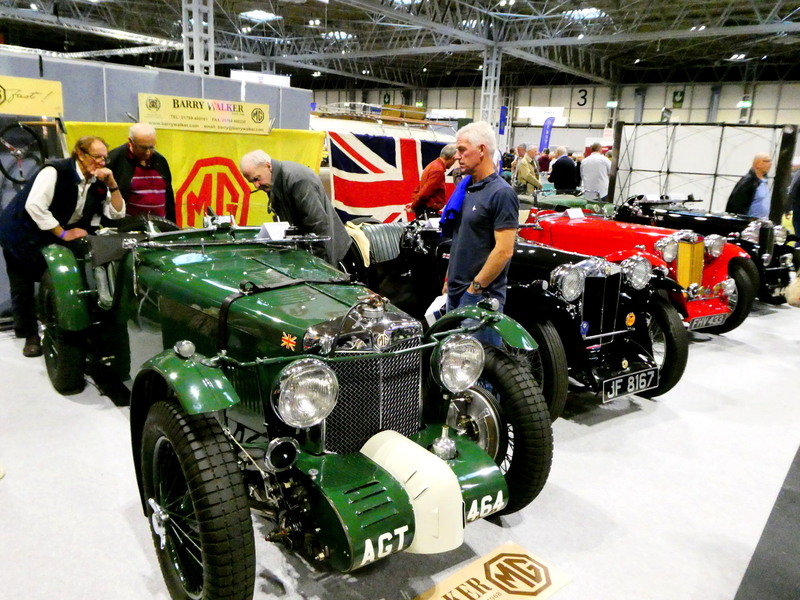 Four club members – Dave Barton, Adrian Bennett, Brian Rainbow and Roger Withers visited the Classic Car Show at the NEC on the Saturday, November 10th. The show seems to get bigger each year, and it is important to get to the NEC early, because the crowds keep on coming, so by mid afternoon it is heaving, and difficult to get near the stands and to talk to the people manning them. It is practically impossible to see everything in one day, so we had to pick and choose what we saw, and weren’t able to visit the Motorbike hall which was on the agenda. MGs were much in evidence – not only on the usual MG club stands, but on the suppliers stands as well, confirming the continuing interest in and popularity of the marque, which is heartening to see. There were inevitably a lot of jaw-droppingly beautiful and desirable cars on show, which tends to make one feel quite envious and slightly dissatisfied with one’s own car, but this only lasts until you realise the cost of purchasing or restoring these wonderful machines, and then you are happy enough with your own classic! A very entertaining, but exhausting day out, not helped by having to stand in an overcrowded train on the way home ……..
No Replies to "Classic Car Show at NEC"